﻿The GCISD Reads initiative is designed to build a love of reading in students - encouraging them to read a large quantity and a wide variety of books. The GCISD Reads program will take the place of the GCISD Book Challenge for the 2017-18 school year! Students will have CHOICE in the challenge they choose this year!The challenge runs from June 1 2017-May 1, 2018. 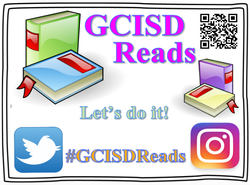 Be sure to follow our Learning Commons twitter at @gatorzread and the hashtag #GCISDReads! Print the appropriate forms below for your child. Each learner who completes the challenge will receive a district certificate for their accomplishments. Choose the challenge below you want to participate in and get started. Your teachers will have the form you need. If you need an extra form, those are attached below. ﻿The Who, What, When, Why and How of GCISD Reads! ﻿​﻿​﻿Who: GCISD students, teachers, and parents are invited to participate. What: GCISD has a huge focus on student voice and choice. This year, GCISD Read has incorporated student choice! Students will have 3 choices to choose from this year! If they finish 1 challenge, they are welcome to continue their reading by leveling up and reading for another challenge! *As part of our new eBook initiative in the GCISD Learning Commons, students meeting any of the challenges (1, 2, and 3) must read at least 2 of their books as eBooks! Audiobooks are suitable both for students who choose to read this way and for those in need of accommodations. When: Between June 1, 2017 and May 1, 2018. Where: Reading can take place inside or outside of school using paper or electronic materials. Why: Students who read more do better in school, have wider vocabularies, and have a lifelong habit enabling them to continue learning beyond their K-12 education.